As a lifelong student of archaeology, I’ve become more and more focused on the Pleistocene and the Paleolithic, that amazing span of the Earth’s history when humanity emerged in Africa and conquered almost the entire habitable surface of the planet. Along the way, we survived multiple ice ages and lived until fairly recently alongside megafauna such as mammoths. 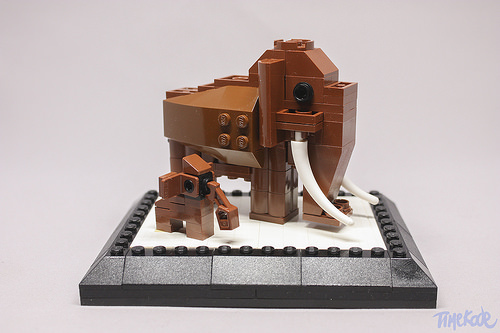 I’ve been meaning to build a mammoth or two from LEGO, so I was pleased to see this adorable mother-and-child pair by Pierre. Noteworthy here is that the adult mammoth is built upside down. And I just love the baby mammoth with its big Dumbo ears. Presented on a base of snowy white, this pair would look great on any paleoanthropologist’s or paleontologist’s desk.